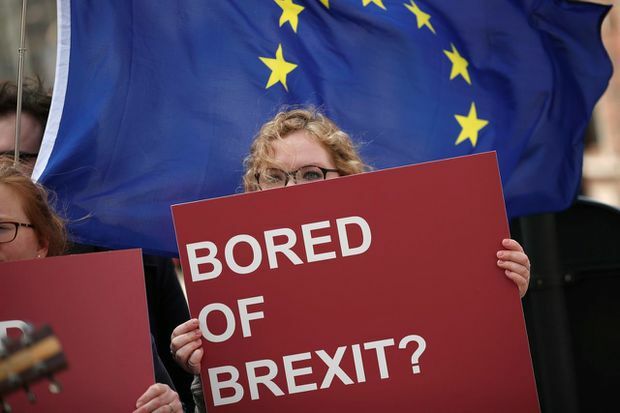 An anti-Brexit campaigner holds up her sign in front of an EU flag during a protest outside EU headquarters in Brussels. Ms. May’s authority has been shattered by her three-time failure to get an exit deal approved by Parliament and a pledge to quit once Brexit is delivered, driving speculation about her successor and a possible national election. Ms. May, 62, took power in the aftermath of Britain’s surprise 2016 vote to leave the EU and has seen her government paralyzed by divisions over Brexit and unable to enact an ambitious reform agenda to tackle social injustice. An Opinium poll published in the Observer newspaper on Sunday showed the Conservatives at 29 per cent, down six points from March 28 and seven points behind Labour. An analysis of polls since the original intended March 29 exit day, published in the Sunday Telegraph, showed the Conservatives would lose 59 parliamentary seats if an election were held now..
Mr. Lidington told the BBC that compromise talks with Labour would continue, with both sides seeking agreement over a plan for Brexit that could win Parliament’s approval. Despite being handed an extension of EU membership until Oct. 31, Ms. May is hoping to pass a withdrawal agreement and lead Britain out of the bloc before May 23 to avoid taking part in elections for the European Parliament. Euroskeptic Iain Duncan Smith, a former Conservative Party leader, said Ms. May should be ready to quit in June. He described the delay to Brexit as “political death” and urged Ms. May to avoid taking part in the European elections. “What the Prime Minister has to do now is aim everything towards departure before the [European parliamentary elections] which would then allow her to step away having done what she said she would do --get the UK out of the European Union one way or the other,” he told Sky News.